Open the animal’s mouth and pull out the tongue. Check the back of the throat to make sure there are no obstructions. Clear away any mucus or blood. Close the mouth. Breathe in and then place your mouth over the animal’s nostrils while you breath out, filling the animal’s lungs with your breath. You should see the chest rise. For small dogs and cats, you may be able to cover the nose and mouth with your mouth as you breathe out. Don’t blow too much air in, especially if the lungs are small, or you could hurt the animal. Give just enough air to make the chest rise. Allow the animal to exhale. For medium to large dogs, give one breath every three seconds. 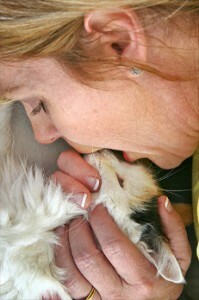 For cats and small dogs, give one breath every two seconds. Give two breaths this way, and then check for a pulse. The best place to find the pulse is on the inside of the rear leg, towards the top of the leg. This is called the Femoral Pulse. An alternative pulse point is on the outside of the left front leg, just behind the shoulder. This is called the Apical Pulse, and it’s in the same area that you would administer heart pumps to a cat or small dog. See the picture of the white cat on the right. If there is no pulse, immediately start heart pumps, as described below. If there is a pulse, continue with sets of four mouth-to-nose breaths, checking for breathing between sets. Some holistic veterinarians recommend giving one dose of Carbo vegetabilis 30c by placing a few pellets on the tongue and putting drops of water on them before the resuscitations, but usually you won’t have time for this unless you happen to have them handy. In cardiopulmonary resuscitation, you’ll use the pulmonary mouth to nose resuscitation technique above and the cardio technique listed below. Remember the ABCs – Airway, Breathing, Circulation. Start by clearing the airway and checking for obstructions. Pull the tongue a little, close the mouth and give two breaths into the nostrils, as described above. Then begin CPR. For medium and large dogs, place the animal on its side with the left side up. Depending on the animal’s size, use one or both hands to cover the heart area, which is directly behind the elbow, as shown in the picture of the black dog. Lock your elbows, and push down with the heel of one hand. If using two hands, the second hand covers the first. Pump hard and fast at a rate of once per second, but not hard enough to break the ribs. For cats or really small dogs, use one hand in a squeezing motion right below the shoulder blades, with your four fingers on the left side of the animal, and your thumb on the right. The idea is to keep the heart pushing blood around until consciousness recurs and the brain takes over again. Alternate sets of heart pumps with mouth-to-nose breaths according to the schedule below. If there are two of you, one starts with the breaths, and then stops while the other does the heart pumps. Make sure somebody calls an emergency veterinarian, if possible. You’ll also want to be checking for breathing to return, and for a heartbeat. The best place to find the pulse is on the inside of the rear leg, towards the top of the leg. This is called the Femoral Pulse. An alternative pulse point is on the outside of the left front leg, just behind the shoulder. This is called the Apical Pulse. There are acupressure points for the heart in the center of the largest pad on the paw, and in between the nostrils. We are not experts in this field, however, so you may want to refer to another source if you are interested in learning more about acupressure techniques. If an animal has collapsed, and there is an extra person around, it can’t hurt to have that person applying strong and pinpointed pressure to these points, or at least the one on the paw pad, while the others are performing the breaths and heart pumps. But your primary goal should be to get to a veterinarian. Some holistic veterinarians also recommend Arnica montana 30c after five minutes of CPR, and Dr. Bach’s rescue formula another five minutes later.